When and where was Filippo Brunelleschi born? Where did Filippo Brunelleschi spend most of his life? He spent most of his life in St. Peter's Rome. What education/training did Filippo Brunelleschi have? Brunelleschi entered the sink guild as a goldsmith. He later became an Architect. What kind of lifestyle did Filippo Brunelleschi have? Brunelleschi was the son of an eminent notary. His architect ideas were rejected several times before he was found by the house of Medici. What type of art did Filippo Brunelleschi create? What were some of the names of his pieces of work? Filippo Brunelleschi created some statues and is now mostly famous for his architect designs. "The sacrifice of Issac" (A statue) He created linear perspective. "Church of S. Lorenzo." (Architecture) He also created the Dome of Florence. Who was Filippo Brunelleschi's patron? When was this piece created? This piece is located in Santo Spirito (Florence, Italy). What is so significant about this piece? Were there any new techniques used? It is a free standing dome. No support beams. A new technique used was stacking bricks a certain way so it doesn't cave in. Why do I find this piece interesting? This piece is interesting to me, because in this time period no one thought Brunelleschi could do this dome successfully. But he had proved so many people wrong. This is why I think this piece is interesting. Which two of the "isms" or Renaissance ideals are most closely linked to Filippo Brunelleschi? Skepticism, because Brunelleschi constantly questioned and doubted his work. He slowly improved himself with his doubts and was able to become as famous as he is now. 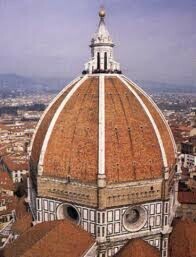 Humanism, because the Medici family relied on Brunelleschi's talent to make sure they grow. There was a lot of room for error but they had faith. Brunelleschi, Filippo. Dome. 1436-1482. ARTStor Database. JPEG file.